The Performer 454 TBI manifold delivers outstanding performance for the street with complete emissions compatibility. With the complete Edelbrock Total Power Package 0-60 times improved by 1.70 seconds (includes manifold #350-3764, cam kit #350-2162 and Tubular Exhaust System). Performer #350-3764 is for 1987-90 Chevrolet and GMC trucks with Mark IV 454 c.i.d. throttle body injected V8 engines. Port exit dimensions: 1.41" x 1.59"
Manifold height: (A) 4.30" , (B) 6.45"
Click here to determine throttle body pad height. Use stock throttle body injection unit. Accepts stock EGR in stock location. 1987-90 Chevy 454 trucks require Edelbrock GM TBI throttle bracket 350-8019. 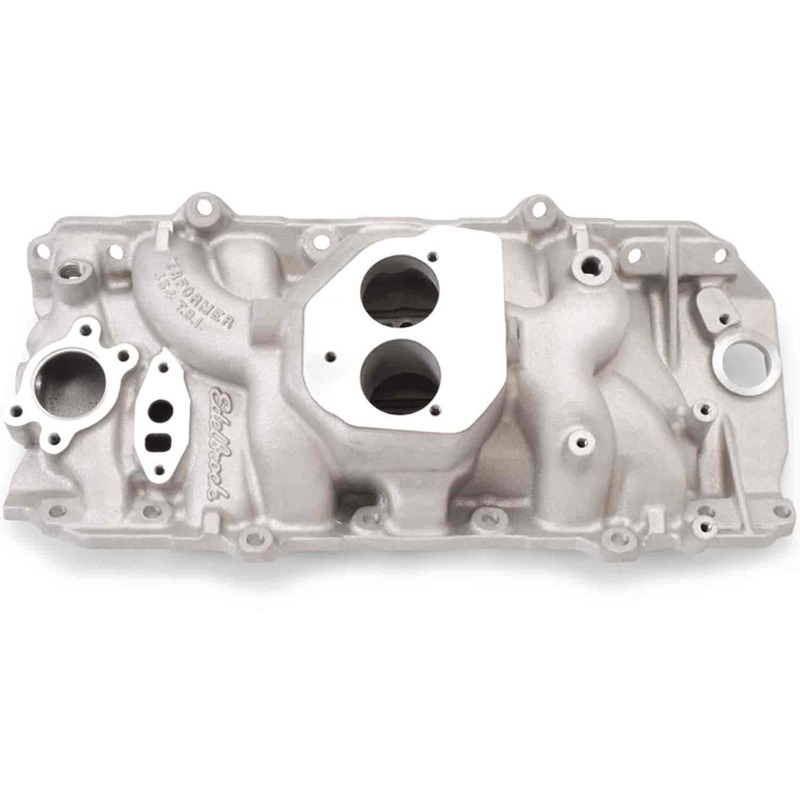 The Chevrolet TBI (throttle body injection) Performer manifolds are dual-plane, low-rise intake manifolds with a 180° firing order and a patented runner design that delivers outstanding performance with crisp throttle response. This patented design greatly improves torque over a wide rpm range, especially off-idle through 5500 rpm. Does Edelbrock 3764 fit your vehicle? 3764 - Edelbrock Performer Manifolds and Kits for Chevrolet TBI is rated 3.0 out of 5 by 1. Rated 3 out of 5 by Backyardmechanic from Looks Nice Hope that you have a good grinder or a friend that is a machinist. you have to grind some of the intake down to fit the fittings in then grind more to get the hose on then grind more to get the hose clamp on. It is lighter then the factory and looks nice. The other thing that they forget to mention is that you need to buy the throttle cable bracket. which would of been nice to know or recommended when you bought the intake instead of placing two orders.